A histogram is a graphical representation showing a visual impression of the distribution of data. It is an estimate of the probability distribution of a continuous variable and was first introduced by Karl Pearson. 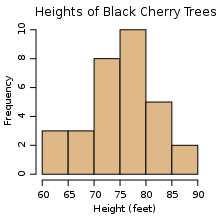 A histogram consists of tabular frequencies, shown as adjacent rectangles, erected over discrete intervals (bins), with an area equal to the frequency of the observations in the interval. The height of a rectangle is also equal to the frequency density of the interval, i.e., the frequency divided by the width of the interval. The total area of the histogram is equal to the number of data. A histogram may also be normalized displaying relative frequencies. It then shows the proportion of cases that fall into each of several categories, with the total area equaling 1. The categories are usually specified as consecutive, non-overlapping intervals of a variable. The categories (intervals) must be adjacent, and often are chosen to be of the same size. The rectangles of a histogram are drawn so that they touch each other to indicate that the original variable is continuous. Histograms are used to plot density of data, and often for density estimation: estimating the probability density function of the underlying variable. The total area of a histogram used for probability density is always normalized to 1. 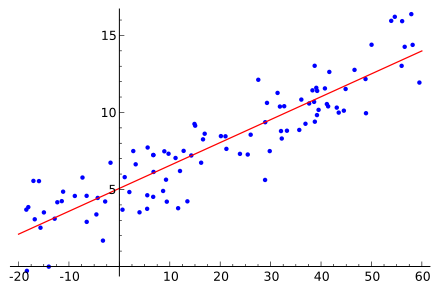 If the length of the intervals on the x-axis are all 1, then a histogram is identical to a relative frequency plot. A Gantt chart is a type of bar chart, developed by Henry Gantt, that illustrates a project schedule. Gantt charts illustrate the start and finish dates of the terminal elements and summary elements of a project. Terminal elements and summary elements comprise the work breakdown structure of the project. Some Gantt charts also show the dependency (i.e., precedence network) relationships between activities. Gantt charts can be used to show current schedule status using percent-complete shadings and a vertical "TODAY" line as shown here. Although now regarded as a common charting technique, Gantt charts were considered revolutionary when first introduced. In recognition of Henry Gantt's contributions, the Henry Laurence Gantt Medal is awarded for distinguished achievement in management and in community service. This chart is also used in Information Technology to represent data that have been collected. Gantt charts have become a common technique for representing the phases and activities of a project work breakdown structure (WBS), so they can be understood by a wide audience all over the world. A common error made by those who equate Gantt chart design with project design is that they attempt to define the project work breakdown structure at the same time that they define schedule activities. This practice makes it very difficult to follow the 100% Rule. Instead the WBS should be fully defined to follow the 100% Rule, then the project schedule can be designed. Although a Gantt chart is useful and valuable for small projects that fit on a single sheet or screen, they can become quite unwieldy for projects with more than about 30 activities. Larger Gantt charts may not be suitable for most computer displays. A related criticism is that Gantt charts communicate relatively little information per unit area of display. That is, projects are often considerably more complex than can be communicated effectively with a Gantt chart. Gantt charts only represent part of the triple constraints (cost, time and scope) on projects, because they focus primarily on schedule management. Moreover, Gantt charts do not represent the size of a project or the relative size of work elements, therefore the magnitude of a behind-schedule condition is easily miscommunicated. If two projects are the same number of days behind schedule, the larger project has a larger effect on resource utilization, yet the Gantt does not represent this difference. Although project management software can show schedule dependencies as lines between activities, displaying a large number of dependencies may result in a cluttered or unreadable chart. When a process has been identified as a candidate for improvement, it's important to know what types of defects occur in its outputs and their relative frequencies. This information serves as a guide for investigating and removing the sources of defects, starting with the most frequently occurring. Note that the defect categories and how process outputs are to be placed into these categories must be agreed to and spelled out in advance of constructing the check sheet. Additionally, rules for recording the presence of defects of different types when observed for the same process output must be set down. When assessing the probability distribution of a process one can record all process data and then wait to construct a frequency distribution at a later time. However, a check sheet can be used to construct the frequency distribution as the process is being observed.